Located on one of the last lava flow that happened in the Puy de Dôme and at the gates of the zone Natura 2000, this plot is the only one I own. We could say that it is my happiness. On this one, I make « La coulée ». It brings together many grape varieties: gamay, portant, muscat, chasselas and above all the famous and forgotten syrah from Auvergne also called damas noir. 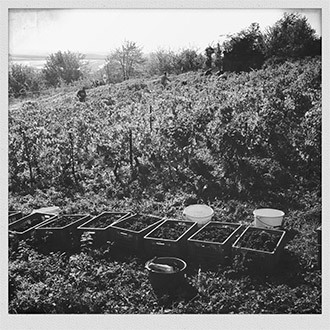 On top of it and for my own pleasure I planted some fer servadou, pinot noir and pineau d’aunis. It is always the plot I have to wait for. I will look for the best ripeness for the syrah, belated variety which, here, on an east facing plot has difficulties to ripen. Therefore, we have to wait hoping that the weather conditions be good and that the birds go look elsewhere for food! This soil is not mechanized, tillage is done thanks to animal traction and treatment with a backpack mist blower. The terroir is a clay-limestone base from the late Oligocene on which we discovered a layer of black powder, probably a basaltic powder. This rich soil makes many self-propagating plant happy. Carrying out an inventory and a study could be long and demanding.